Since I wrote the 2018 President’s Letter one year ago, the situation we are facing domestically in the United States has only become more critical, and the role of our projects more vitally important. The work of Mediators Foundation’s projects — each in their own unique way — are like the antitoxin to the poisonous demagogic leadership that has been gaining momentum during the last few years. The 3S Project: steering American foreign policy to prevent, rather than trigger war. Philanthropy Bridging Divides: linking CEOs of major philanthropies across the partisan divide to build trust and collaboration. Bridge Alliance: now an independent network of 100 organization that are building a powerful transpartisan network and movement. LivingRoom Conversations: bring new skills and format to enable families, communities and organizations to discuss difficult issues. AllSides for Schools: empowering students to learn how to analyze the news from multiple perspectives. Common Ground Initiative: building a new cultural narrative about public lands to foster wise use and safeguard them for future generations. Active Peace: a transformational approach for civic engagement based on nonviolence and restorative justice. United Politics Initiative: tackling deeply challenging problems with bi-partisan, data-driven, and community-based approaches. I celebrate each of the initiatives that are being nurtured under the Mediators Foundation roof and encourage you to learn more about them by going to our website mediatorsfoundation.org. The danger we face now, however, is not about democracy having a crack, but rather about it being broken, perhaps beyond repair. The arc we are following at the moment is not toward light, but toward darkness — not an enlightenment, but an endarkenment. Even before the recent fear mongering about a “national emergency,” it was clear that the role of demagogic leadership in our culture was growing ever stronger. For the first time in recent American history, the President of the United States arguably meets all ten criteria for demagoguery. Clearly the demagogue represents a direct threat to democracy. If we allow such leadership to take root in our civic culture, and to gain power over key institutions, the impact will be the same in America as it is any country. Demagogic leadership will destroy trust, undermine civic discourse, and — like a car engine without oil — bring democracy grinding to a halt. The result will be paralysis, chaos, and, unless opposed, violence. As democracy is being poisoned by demagogic leadership, we need the antidote of bridging leadership that our Foundation’s remarkable projects embody. This kind of leadership — one that heals divides, rather than expands and exploits them — goes by many adjectives in many cultures: enlightened; integral; peaceful; inclusive; sacred; etc. 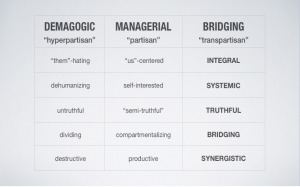 It also is defined by nouns: mediator; peacemaker; bridge-builder; etc. As senior political strategist Rob Stein rightly concludes, we are at grave risk of “splintering into discordant tribes.” That can be remedied only if we “foster new cross partisan relationships, establish communications vehicles and platforms for the robust exchange of ideas, recruit and elect a new generation of leaders committed to ideological diversity and encourage evidence-based policy formulations that span traditional cultural and political divides.”As the italicized phrases “cross-partisan” and “span…divides” underscore, bridging leadership is the critical ingredient to renewing our political life. Thank you for caring about ourwork —and for the work youdo — that keeps the light of democracy shining brightly.